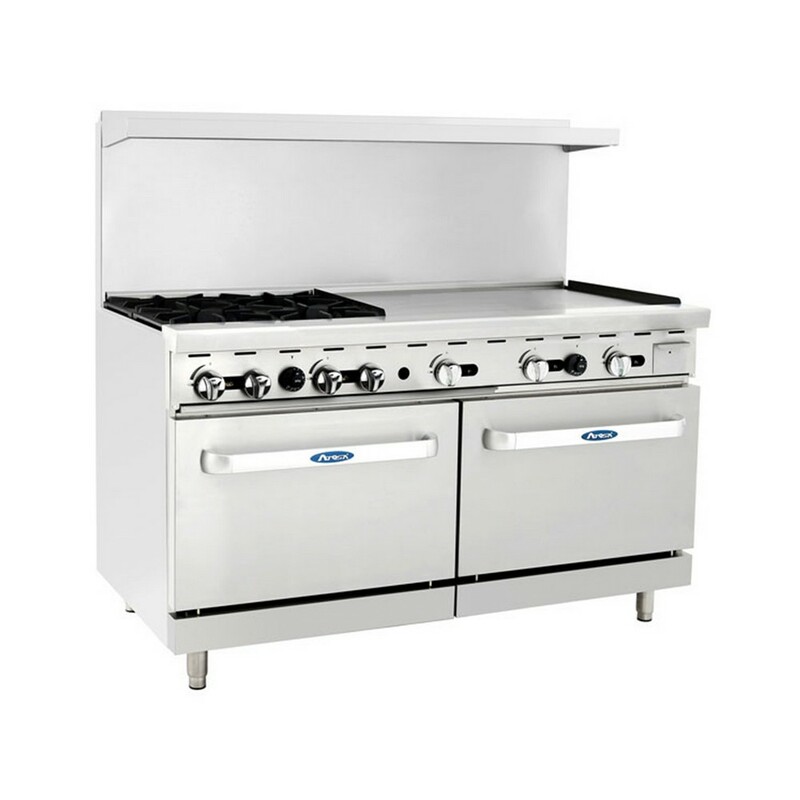 Get top cooking performance and extra long service life with the Atosa ATO-4B36G 60" Gas Range, (4) Open Burners with 36" Right Griddle and (2) 26-1/2" Ovens. Constructed with a stainless steel back, front, sides, kick plate, high shelf and back guard, this oven is exceptionally durable and its cast iron grates are tough enough to withstand high temperatures without warping. Featuring 4 burners, 2 ovens and a griddle, it can be used in restaurants, hotel and institutions for a wide range of cooking tasks. Designed with cast iron grates that have a grease trough on each blade and a built-in bowl, it directs excess oil and grease to the proper zone and its safety valve stabilizes the flame in case of emergency. In addition, it has adjustable stainless steel legs that make it easy to level on uneven surfaces and its stainless steel tubing is easy to clean and extremely durable. Oven size: 20" x 26" x 14"
For the most part I love new grill. However it has several design flaws. The acute burners have no adjustment to high flame setting. Turning it to lower flame is odd, turning down has no effect on flame until at least half way. The cast iron covers are too large for 7 inch egg pan, they tip sideways. The grill left and right sides are only about a inch high, causing hash browns to spill onto floor when using metal spat to plate them. And the back guard has 3/4 inch gap before touching grill, creating a difficult way to clean with grill brick or griddle screens. The pilot lights should have been electronic, my fault.